“We’ve pledged to reduce our greenhouse gas emissions from operations to zero as fast as possible,” said Shane Stennes, the university’s sustainability director. The University has been exploring renewable energy opportunities to meet their goals. In its 2011 Climate Action Plan, the University set a goal of reducing greenhouse gas emissions 50 percent by 2020 and achieving net-zero greenhouse gas emissions by 2050. The University of Minnesota is taking a comprehensive approach to meeting their goals with renewable energy. 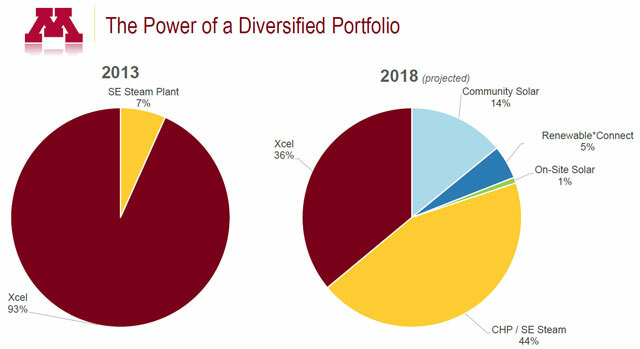 In a recent presentation, Shane Stennes talked about community solar, on-site solar (details below), Renewable*Connect from Xcel Energy, the new combined heat and power and steam plant. The University’s projected power mix for 2018, and the dramatic difference from 2013. How it all started: In 2015, the University of Minnesota’s Energy Transition Lab created the SUN Delegation with guidance from the Midwest Renewable Energy Association and Institute on the Environment. Between 2015 and 2017, the Delegation worked with University staff and faculty to identify pathways to invest in solar energy. These efforts were an instrumental catalyst in encouraging University decision makers to invest in solar. On-site solar coming to the U: After negotiations with Ameresco, the final contract for on-site solar will include 2 MW of solar installations to be installed on the Twin Cities campus with roof-mounted systems on Ruttan Hall, Learning and Environmental Science Center, Continuing Education Building, Mondale Hall, Wiley Hall, and Center for Excellence, as well as carports at Gortner Avenue Ramp and Parking Lot C86. Want to learn more? Read about their plans for this year in a recent Minnesota Daily article or contact Shane Stennes, Director of Sustainability at the University of Minnesota via email or at 612-626-2588.